Blake and Burke in Astonishment! RODNEY M. BAINE is Franklin Professor of English, Emeritus, at the University of Georgia. MARTIN BIDNEY, Associate Professor of English and Comparative Literature at SUNY Binghamton, is the author of Blake and Goethe: Psychology, Ontology, Imagination (U of Missouri P, 1988). V. A. DE LUCA is Professor of English at the University of Toronto. ALEXANDER S. GOURLAY teaches English at the University of Nebraska-Lincoln and is working on a book about Blake’s 1809 exhibition. MICHAEL GRENFELL is a Lecturer in Education at Southampton University, and Press and Publicity Officer for the Blake Society at St. James’s, London. His principal interests are Blake, Jung, and gnostic traditions. DESMOND KING-HELE is a scientist who has specialized in the mathematical analysis of satellite orbits. His literary books include Shelley: His Thought and Word (3rd ed., 1984), Erasmus Darwin and the Romantic Poets (1986) and two volumes of poems. He is editor of Notes and Records of the Royal Society of London. 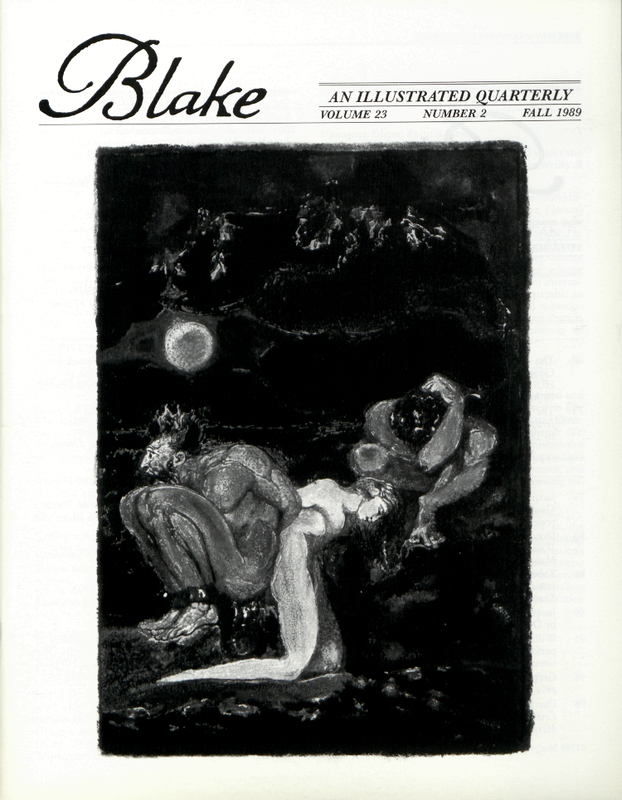 ANNE K. MELLOR, Professor of English at UCLA, is author of Blake’s Human Form Divine, English Romantic Irony, and Mary Shelley: Her Life, Her Fiction, Her Monsters. She is currently writing a book on the masculine and feminine romantic ideologies. DENA BAIN TAYLOR is Assistant Professor of English at the University of Toronto and owner of Ben Abraham Books. She has recently completed a book on Blake and the Kabbalah. JOSEPH VISCOMI teaches English at the University of North Carolina, Chapel Hill, and is the author of Prints by Blake and His Followers, and The Art of William Blake’s Illuminated Prints. DAVID WORRALL, Associate Editor of Blake, is presently working on Thomas Spence, the Pigs’ Meat man. Manuscripts are welcome. Send two copies, typed and documented according to the forms suggested in The MLA Style Manual, to either of the editors: Morris Eaves, Dept. of English, University of Rochester, Rochester, NY 14627; Morton D. Paley, Dept. of English, University of California, Berkeley, CA 94720. Please send floppy disks if your manuscript was typed on a word processor, and note the name of the computer, the word processing system used, and the file name of your article.